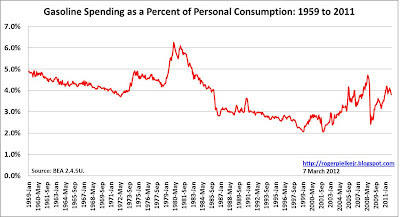 Continuing the ongoing discussion of gasoline prices and the economy, the figure above shows gasoline expenditures as a fraction of personal consumption expenditures for 1959 through 2011 (Data: BEA). You can see that gasoline ended 2011 at about the 4% level. Gasoline spending was actually higher in September 2011 (4.1%) than in December (3.8%). The increase of 1% -- from 2.8% in May 2009 to 3.8% in December 2011 -- coincided with a 70% increase in the price of gasoline (data: BLS). 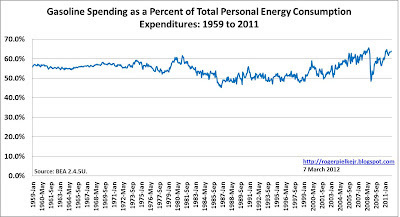 The graph below shows total energy spending (where energy is defined as the sum of expenditures on gasoline, heating oil, electricity and natural gas) from 1959 through 2011, and it shows that total energy spending is just under 6% of personal consumption expenditures. To some degree, higher priced gasoline has been offset by lower spending on heating oil and electricity. 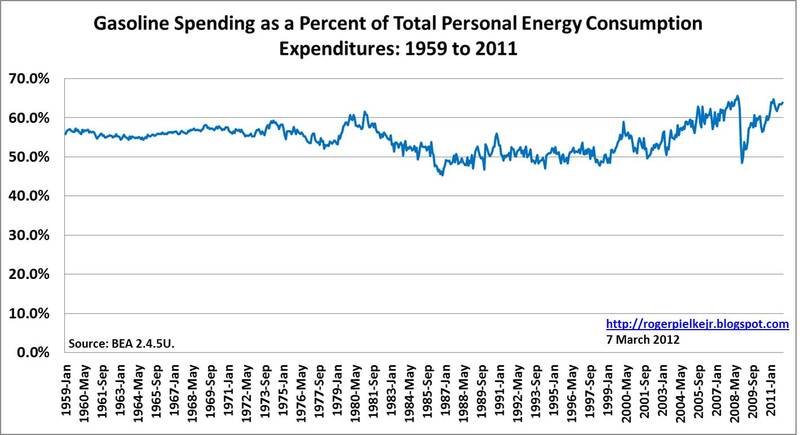 The third graph, below, shows gasoline spending as a percent of total personal energy consumption expenditures. 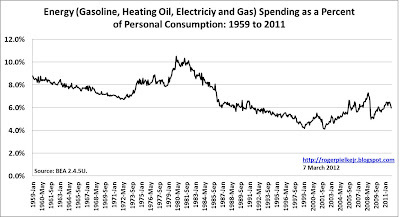 The graph shows a remarkable degree of consistency over many decades with gasoline comprising between 50% and 60% of total energy expenditures. Gasoline has increased above the 60% threshold as gasoline prices have increased and other energy expenditures have remained constant or declined. 1. The US economy is not yet in a danger zone with respect to gasoline prices -- $4 dollar per gallon gasoline is not what it used to be. 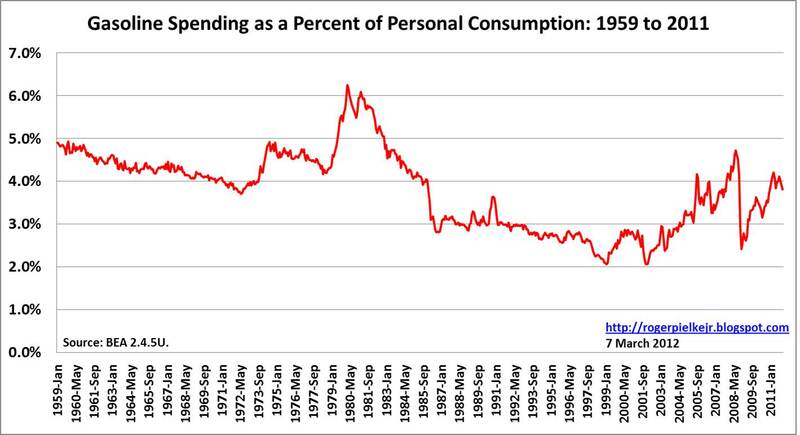 What would it take for gasoline to exceed 5%, 6% or more of personal consumption expenditures? It is not easy to answer with any confidence, but if the increase in price of $1.50 per gallon or 70% from May, 2009 to September, 2011 resulted in an increase in personal gasoline consumption expenditures of 1%, then assuming linearity (caution: rarely a good assumption, but lets play around), then we'd have to see gasoline prices of more than $5 per gallon to reach that 5% threshold. 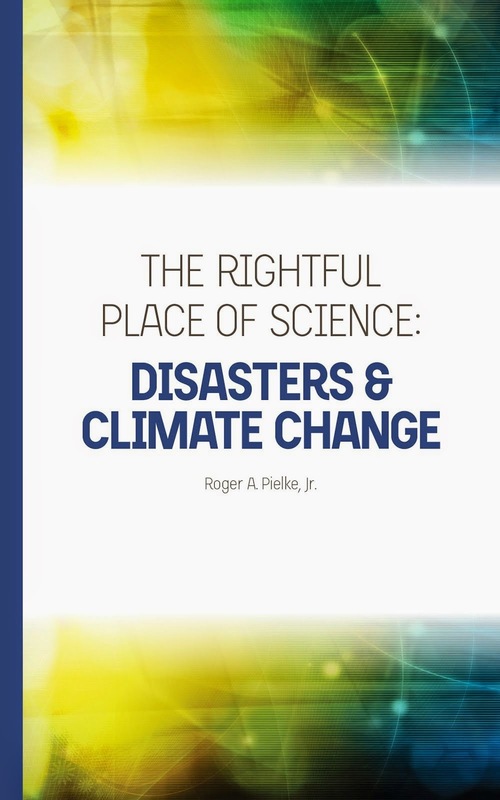 There are good reasons to think that such an outcome is not imminent. 2. The overall impact of gasoline prices is somewhat muted in the context of total energy expenditures because of the falling price of natural gas. To the extent that natural gas can replace gasoline (not easy in the short term) this trend will be accelerated. Meantime, consumers will see a bit of an offsetting balance in their total energy expenditures due to lower electricity and gas prices. A hot summer could easily lead to increased expenditures as air conditioning is cranked up, and summer is traditionally when there is more demand for gasoline. 3. Why did things appear to change in US gasoline spending starting 2002? My guess is China, which joined the WTO in 2002 and subsequently saw its oil consumption increase by almost 90% from 2002 to 2010, a period of remarkable economic growth. Over the same time period the United States saw its oil consumption decline by more than 3% (Data: BP). Such trends are likely to continue, making it more important for the US to reduce the gasoline intensity of its economy and/or develop new resources. The pressure to drip and pipe will only increase. 4. In the context of such trends, it should be a matter of policy to seek to reduce the share of economic activity expended on gasoline in particular and energy in general. The good news is that there does seem to be a consensus, even in these most partisan of times, on what makes for a common sense energy policy -- The Economist makes a good start. H/T: Daniel Ahn and James Hamilton for useful analyses along similar lines.